Thank you for joining Scripture & A Snapshot. Leave a comment with a verse that God has placed on your heart this week, or leave a link to your own post sharing a Scripture and a Snapshot. Take time to visit some of the other links, too. If you would like to join our group Pinterest board for Scripture & A Snapshot, simply follow the board then leave a comment to let me know your Pinterest name or email used there. Is this your new little one? Not mine, but I love her. We got to meet my cousin's baby girl today. This is my oldest daughter holding her. My "baby" is eleven. And the blessings only get bigger when the Lord gifts you with grandchildren. I'm loving this season of life. Precious photo, and precious scripture. 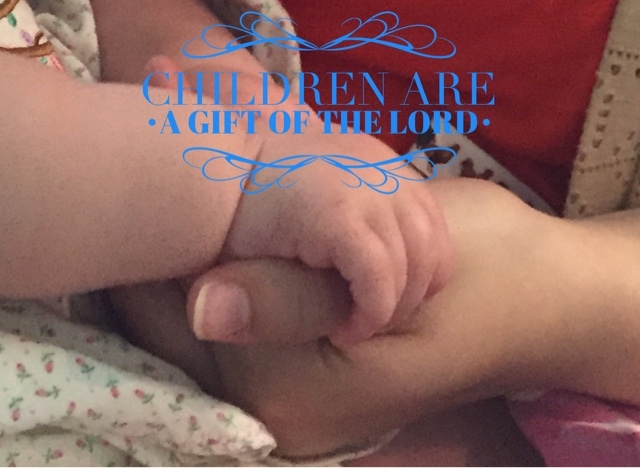 Children are certainly a gift from God. thanks for clearing up the link for me. I am glad I found it because I enjoy posting on this meme.